Jonathan, Ahab, and the Professor go rafting on the Oriel again, this time in pursuit of treasure in Selznak the Dwarf's abandoned castle. Before you can say "migweed," our heroes are swept off by Twickenham the elf aviator and dispatched, along with Dooly and the linkman-poets Bufo and Gump, through a magic door into the land of Balumnia, on the trail of the missing Squire Myrkle, last seen gazing into the Lumbog Globe. Jonathan is convinced Selznak the dwarf vivisectionist is somewhere behind it all. And who is Sikorski? Est-ce que il y a quelqu'un ici qui parle français? 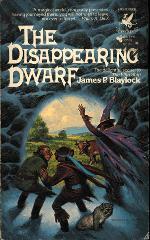 If so, you might want to check out Blaylock in translation, if only for the bizarre covers on some of his books. Notice the alligator-headed Elizabethan riding the giraffe. It calls to mind Tolkien's reaction to the first cover illustration for the American edition of The Hobbit, which featured a sort of psychadelic Christmas tree and an emu: 'I begin to feel that I am shut up in a madhouse.' 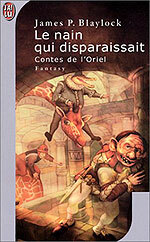 You can buy this zany French edition through Amazon Canada here.